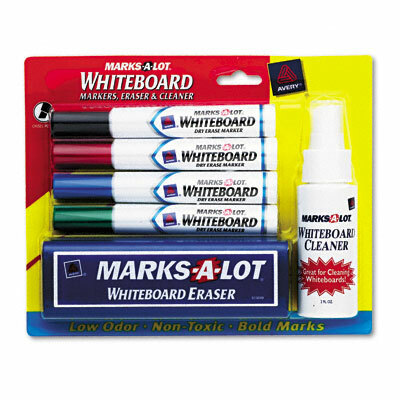 All you need to complement your whiteboard. Kit features wide barrel dry erase markers in black blue, green and red for whiteboards, glass and other nonporous surfaces. Durable chisel tip writes in three line widths and won't "mush" or fray. Ink wipes off easily with a dry cloth or eraser. Also includes white board eraser and 2 oz. whiteboard cleaner. All you need to complement your whiteboard. Kit features wide barrel dry erase markers in black blue, green and red for whiteboards, glass and other nonporous surfaces. Durable chisel tip writes in three line widths and won't "mush" or fray. Ink wipes off easily with a dry cloth or eraser. Low odor and nontoxic; ACMI certified (conforms to ASTM D 4236). Also includes white board eraser and 2 oz. whiteboard cleaner. Black, blue, green, red.